A new Pakistan shone on the global podium this week, as Prime Minister Imran Khan announced exciting new changes to the country’s visa policies. As of this week, tourists seeking to obtain visas to Pakistan will be able to do so within the comforts of their home through a new online visa system available to foreign tourists from 186 countries. The beauty of travelling on foreign grounds is having the freedom to discover nations, cultures, and experiences first hand. Eat a Napolitano pizza right in the buzzing city of Naples, stand below the Eiffel Tower in its magnificent glory, or discover The Silk Road of the Orient in Pakistan. Citizens of China, Malaysia, Turkey, UAE, and UK will be amongst the first to avail from the three-month visa. Additionally, an E-Visa will be granted to a total of 175 countries, with a Visa-on-Arrival to 50 countries. The processing time for both manual and e-visas is expected to take up to 7-10 working days. Successful applicants will be sent a notification via email and SMS which will be reviewed upon entry into Pakistan. Talk about an updated technology! Visitors simply have to log in to https://visa.nadra.gov.pk, fill out the application, upload the required documents and make the visa fee payment. “Pakistan has seen tough times in its efforts to combat terrorism but the situation today is different,” said the Prime Minister, during his address at the ceremony, giving credit to the efforts of the security forces and intelligence agencies. He concluded by stating that Pakistan is confident today that it has taken the first step on a new path to peace and progress. With these visa waivers in mind, the Global Passport Ranking has seen slight shifts in ranks. 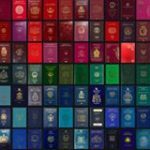 The UAE passport has maintained its lead with a reinforced visa-free score of 169, while Canada has dropped to 5th place with a visa-free score of 164. More and more governments are discovering the impact their visa-free scores, and welcoming scores have on their nation’s position and stature on the global stage.